Free 50ml Shampoo and Body Wash! with a £20 spend on Weleda! Weleda Gift Sets are a great way of introducing yourself or a friend to the Weleda range. Featuring miniatures of some of the brand's best-loved products, we're sure you'll quickly fall for all that Weleda has to offer mind and body. 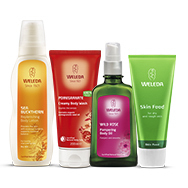 Weleda's award-winning Hair Care range contains natural solutions. Keeping your hair in tip-top condition. Holistically formulated, each hair care product features NATURE-certified combinations of mild and skin-friendly ingredients to unleash the hair's natural strength and beauty. Harnessing natural cereal ingredients, Weleda shampoos, conditioners and intensive treatments mimic the action of cereal growth to promote hair's vitality. Weleda's skin care range treats every concern. From teenage spots right through to the first signs of ageing. Seasonal weather, hormones, stresses and over-indulgence all attack our skin, so it needs to be cared for correctly - if you want to discover the secret of natural beauty, look no further than Weleda. 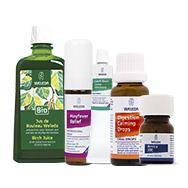 Using selected, pure natural ingredients from fine plant oils, plant extracts and fragrance blended from essential oils, all their products are both effective and gentle. A sumptuous, natural range of body scrubs and washes. Caring for your lips, hands and feet from holistic brand Weleda. 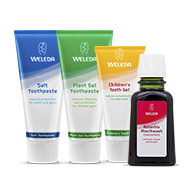 Choose the natural way with Weleda's range of toothpastes. No nasty additions, they're just as effective as your regular toothpastes and mouthwashes, but are naturally sourced and produced - leaving you with healthy, fortified gums and teeth and the freshest breath for miles! Weleda's multiple-award winning maternity and baby range. 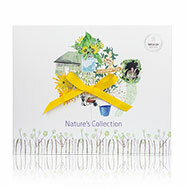 Containing gentle, natural products to calm and soothe baby's skin and to ease mothers through pregnancy. 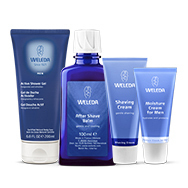 Weleda's men range contains products to moisturise and hydrate skin. Keeping skin soothed and calmed during shaving. Perfect for any health-conscious gentleman, all Weleda's products have a commitment to natural ingredients with holistic properties, ensuring both mind and body receive the restorative treatment of Weleda's men's range. Weleda's pharmaceutical products are naturally powered. Harnessing anthrosophical properties to ensure every treatment works. Weleda believes that in order to treat an illness, it's important to consider not just the physical symptoms but also the spiritual condition of the mind, alongside the personality and lifestyle of the patient. Anthroposophical medicine complements conventional medicine with the findings of spiritual sciences, a practice that Weleda is well versed in, producing remedies according to this particular perspective on medicine. Their pharmaceutical products support good health naturally so that the body's health is restored, and all products stimulate the body's self-healing powers. 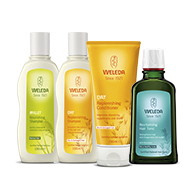 View all Weleda products in one place. With so many brands claiming to be natural it is important to know what you are buying. Weleda has been growing and creating natural, organic herbal medicine and body care products for over 95 years, often to the same original, authentic recipes that have stood the test of time. Put simply, Weleda was the first natural cosmetics brand and has pioneered the way for others to follow - from organic biodynamic farming and cultivation to setting the standards for ethical and sustainable business practices. Today, Weleda is the world’s No1 producer of natural skin and healthcare products, supplying across five continents. Absolutely everything that goes into Weleda's products are made from pure, natural substances, and artificial preservatives are strictly off the menu. Weleda are encouraging us all to wake up naturally and stay that way, switching to clean beauty choices. Whether you’re careering down a ski slope, powering up a hill on your bike or stretching to the max with some hot yoga, arnica delivers deep muscle warmth and relief from aches both before and after your workout. Founded in 1921 and now active on five continents, Weleda's primary aim is to maintain, support and restore human health. A brand that started as a pharmaceutical laboratory is now the world-leading manufacturer of holistic, natural cosmetics and pharmaceuticals for anthroposophical therapy. 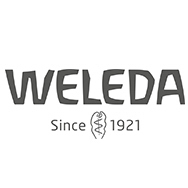 Weleda manufactures over 2500 pharmaceutical products, 120 natural cosmetics and 10 dietary products worldwide. Absolutely everything that goes into Weleda's products are made from pure, natural substances, and artificial preservatives are strictly off the menu. Truly in harmony with the human being and nature, Weleda's products are renowned across the globe for their healing and nourishing properties - whether it's their potent skin care or medicinal aids. Trust that you are in good hands with Weleda! Weleda believe ‘that when we are in balance, our energy, vitality and beauty shine.’ This is why they choose to craft every product with plant / flower-sourced ingredients which have great restorative effects. Weleda have been creating products for close to a century, and they’re all cruelty free! Parabens – Methylparaben can often lead to accelerated skin aging. Preservatives – Weleda believes that preservatives are intended to kill biological organisms and therefore that should come into contact with your skin. Sodium-Laurel-Sulfates – This substance can dissolve natural skin oils and can cause irritation. Synthetic Fragrances – These are often used due to being cheap, but can cause allergic reactions, irritation, and rashes. Phthalates – This substance disturb the hormone system and therefore Weleda believes this should not be in their products. GMOs – Genetically Modified Organisms are believed to harm the environment, famers and community. This goes against what Weleda stands for. Weleda Skin Food – created in 1926 this has fast become one of the most well-known back-stage beauty secrets, as it is able to nourish any past of the body – especially hands, feet and elbows. Ideal for skin which is, flaky, dry or needs a little extra moisture. Weleda Wild Rose Creamy Body Wash – formulated with essential fatty acids and rose oil this product is perfect for stressed skin. With Damask Rose organic essential oil which also provides a subtle, pretty fragrance.